Our beautiful Emerald Coast contains some of the most diverse recreation choices along Florida's Gulf Coast, and some of the best options for visitors seeking an affordable family vacation. Our Northwest Florida Beaches International airport (EMC) and our Destin, (VPS) airport have made more flights available for this area and more affordable . Maravilla's Gulf front view building is #2, facing the Gulf of Mexico with an unobstructed view of our sugar white beach. There is a gulf view pool, portico, beach shower, pool side rest rooms, and grills to accomodate Bldg. #2. Maravilla 2301 is a third floor corner unit, with a larger balcony, and a direct view of the Gulf. It is upgraded each year. The master bedroom with full ensuite bath, has a King size plantation bed, large dresser, wall mounted HDTV , tropical fan, black out drapers, and a large closet. All flooring is porcelain tile. The guest bedroom has a pillow top gueen size bed, with accessable bath. This room also has a new flat screen TV/DVD player. The kitchen is fully equipped with all you will need for your stay. The dining table seats 6. There is a laundry room with full size washer /dryer and storage cabinet. The soft antique white palette, with turquoise accents compliment the beautiful Gulf View from your living room, new queen sleeper sofa, two 'comfy' chairs and an entertainment center with TV/DVD/STEREO/High speed wireless internet. You will enjoy this newly decorated unit, guranteed!!!! 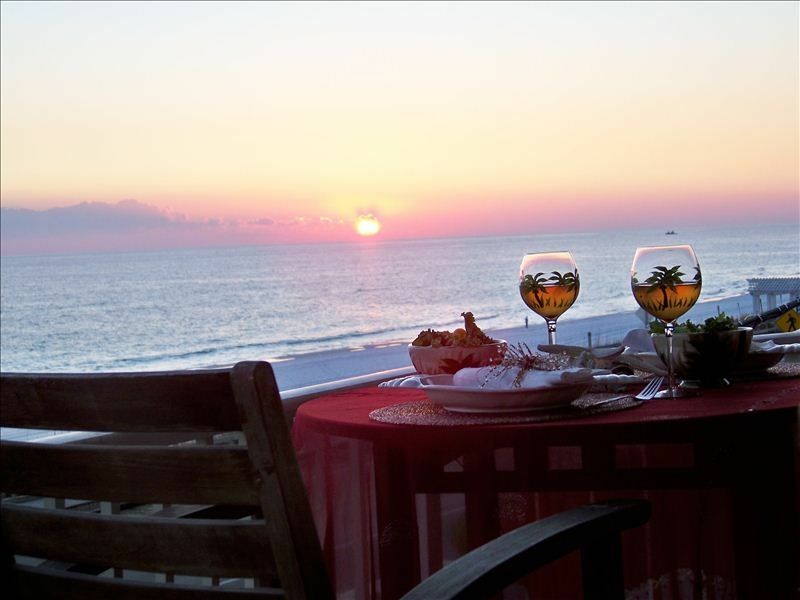 Sit at your bistro table and enjoy the view of the Dolphins playing in the surf or just sit back and relax . A book selection is available for reading. During high season (March to October) four beach chairs/two umbrellas ARE set up for you each morning of your vacation. Be sure to tip the attendant for his great service. Maravilla Resort Condominums, 2606 Scenic Gulf Drive , Destin, Florida is the most popular family oriented complex in Destin. We are a 33 acre, gated resort, with expansive interior parking, portico for loading & unloading, tennis courts, basketball half/court, two pools, spa, fitness room, club house available to rent for family gatherings or weddings on the beach, bike racks, and shuffleboard. We have it All! Oh, I forgot to mention the 2.5 acres of private beach, the largest private beach on Miramar Beach. We also set up beach chairs each day for your pleasure. Once you have enjoyed our accommodations you are DESTINed to become a regular. WE APPRECIATE OUR WONDERFUL, REPEAT VACATIONERS, MANY HAVING BEEN WITH US FOR MANY YEARS. Keywords: Pet Friendly family beach vacation rental by owner - Gulf Front View Maravilla Condos, beautiful Miramar Beach, Destin, Florida , pets welcomed, free wifi, beach chairs. Our 3rd floor corner unit, Maravilla 2301, is a beautiful unit, nautical decor, very nicely furnished and upgraded each year, 90% of our vacationers are repeat visitors, and we like to provide them with something a little different from their last visit. Oh, also we have another awesome GulfFront View condo, located in bldg. #2, the GulfFront building. It is a ground floor condo. January 2016 Master bath completely remodeled with tile shower/jetted tub. Guest bath room completely remodeled with enlarged tiled shower with two shower heads, one a rain shower head. Sea 4 Miles, Sea for yourself!!!!! Maravilla Resort is a gated Beachfront Community, with one of the largest private Beach areas on Miramar Beach. This unit directly faces the beach. It will seat 6 guests. 50 In Wall Mounted 4G Smart TV in Living room. Master and Guest bedroom has wall mounted flat screen televisions with Digital boosters in all three rooms. We do not provide bicycles; however, there is a number to call and they will be delivered to you, and a bike rack is on site. Destin Harbor has boat and seaDo rentals available. We have a beautiful Bay area for safe boating. Balcony with an amazing gulf view. You are in A golfing mecca. Go to our website, Things To Do In Destin , for Golf courses listed, there is also information in the unit. Heated from November through March. DESTIN has one of the cleanest and most beautiful beaches in the world, we are a golfing, deep sea fishing, family friendly village. Tons of shopping, restaurants, boutiques, spas, and offer you an Ocean, Harbor and Bay for you vacation adventures. WE HAVE IT ALL!